Like an excited kid, I checked my phone. I waited impatiently. I jumped up from sitting on the couch to walking to the front door then back to the kitchen. Back to the couch. My husband said he saw headlights. Maybe it was them. I got so excited, I walked to the front window to check. Nope, not them. Oh, gross. It was like a beetle fest on our front porch screen door. I turned out the floodlight. And the entry way light. Hello, dark night with the bright banana shaped moon shining. Happy moon. And just a couple of stars out. Maybe they weren’t coming, I thought. I forget things. I suppose I get easily distracted. For good and for bad. I’m not the best hostess, but oh, how I love hosting friends. Especially the best kind of friends. Old friends. I washed the sheets and comforter. Set clean towels out. Dangit, I forgot to empty the bathroom trash. I wanted to get some handmade local soap for the shower. And put some treats out. And signs up. I wanted to get one of those cakes from Whole Foods. Would they be hungry? A text popped up on my phone. It was 11:00 at night. My friends from far, far away, like a sixteen hour drive away. They’re here! I looked out the front door, standing in the dark, I couldn’t see them from inside. We hugged. I apologized for the weird “nobody’s home” feel because of the intense beetle situation. We all came inside. Sometimes you can’t begin to fathom how much you have missed a person until they are right there. In front of your face. In your kitchen. Talking. Laughing. Memories all the sudden flash flood your heart. Real life. Crazy college memories. All of those memories. It’s the best. We all split a salted caramel beer. Sat down at the kitchen table. Started catching up. Uh, oh. Smoke starts to fill the room. Something’s burning. Natually, everybody grabs a place mat and starts waving up some of the smoke that’s filling the kitchen. It’s kind of like a nightclub, with the fog. It just smells like burnt food. The four of us can’t stop laughing while dispersing the cloud of burnt bread smoke before the alarm goes off and wakes the kids. I guess I forgot about that hamburger bun/future cinnamon toast from the morning. Black burned. And my good old friend is laughing. Unphased. I’m sure she half-expected me to burn something in honor of her arrival. We talk, try to catch up and interrupt each other. Mainly overlyexcited me, I think. It’s hard to face-to-face catch up on the past few years. Sometimes I fire a lot of questions. All at once. It’s hard to know which one to answer. Kind of like a couple brightly colored dodge balls coming at you from all different directions. I tend to interrupt with a story and I forget what the point of that story was. Oh well. We all laugh. Then, oh yeah, I remember the point of that story. Finish it up. What were you saying before I cut in? Sorry. I’m so happy. Like a kid kind of happy. Just me. I can be me. No faking, no acting interested, no wishing I were somewhere else. Here. Present and wanting to freeze time. The next morning we all have crazy colored homemade super hero waffles and coffee. 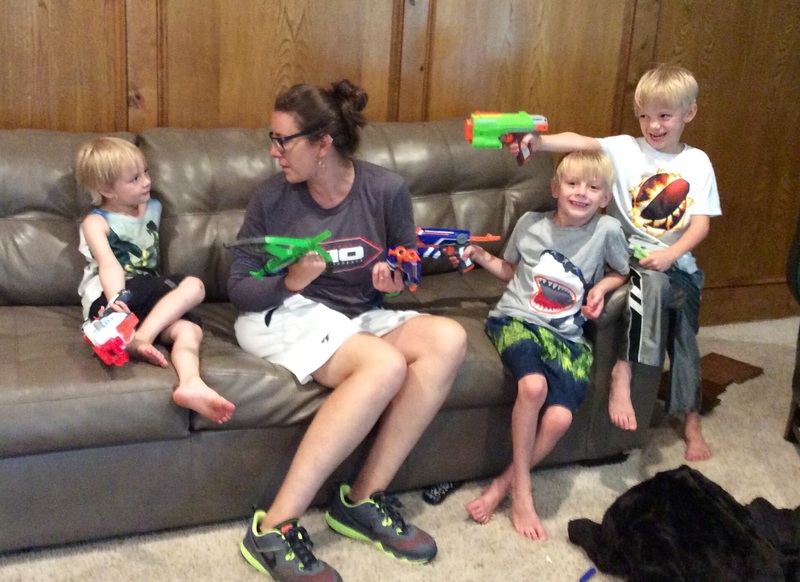 And Nerf gun battles with the boys. What a happy start to a day. If only I didn’t have to go to work. And they didn’t have to get back on the road. Ahhhh. Don’t leave. Not yet. You just got here. Remember, just last night. If the Penske truck weren’t so full, my boys and I were ready to hop in the back. Why did you have to have so much stuff? Colorado bound. Until next time, hopefully soon. Genuine real deal deal friend with your arm hanging out the truck window. The best kind of friend. Catch-up-right-where-we-left-off friend. Time will never change us kind of friend. Rare friend. Precious friend. God put us in the same place at the same time. I already miss you, friend.